This crispy tuna patties recipe is a super quick, easy, and healthy dinner idea! Adding a touch of mayo keeps these tuna cakes tender on the inside, yet crunchy and delicious on the outside… And did I mention they’re budget friendly? This is a sponsored conversation on behalf of Blue Harbor Fish Co; all opinions and text are my own. Thank you for supporting the brands that support this site! Tuna Patties For The Win! Much like this beloved Parmesan-crusted chicken recipe, these crispy fried tuna patties were a weeknight regular when my husband and I were newlyweds. Back then we were living on a first-year apprentice’s wages, and budget-friendly proteins (like pouch or canned tuna fish) were a necessity for maintaining our meager grocery budget. 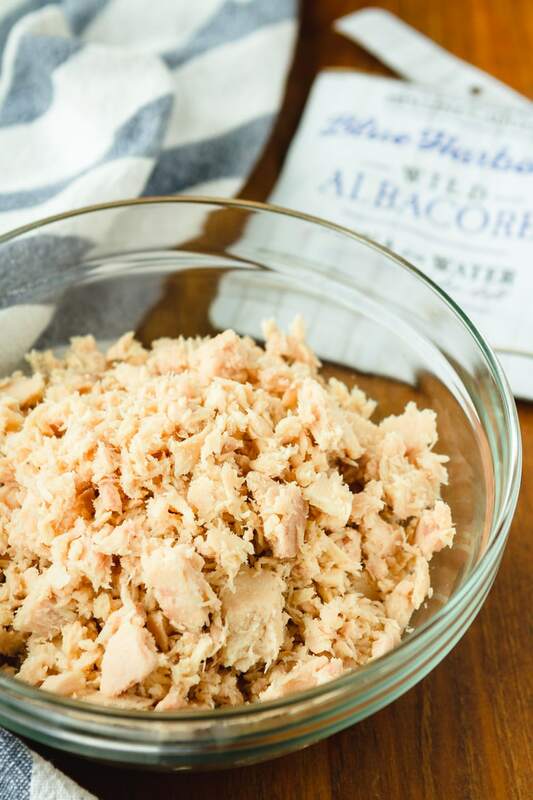 It’s been ages since I’ve made them, but tuna patties were the first recipe that I thought of when I received a package of Blue Harbor Albacore Tuna pouches recently. A quick survey of my pantry showed that I had all the necessary ingredients on hand. That’s what’s so great about a simple tuna cake recipe like this — you can almost always throw it together at a moment’s notice if you keep a well-stocked pantry. After trying these tuna pouches, Blue Harbor will definitely be on my list to keep stocked. Blue Harbor is Marine Stewardship Council certified, which means it comes from fisheries dedicated to sustainable fishing. Each pouch is filled with sustainably-caught, wild Albacore tuna that’s hand-selected and packed with only water or water and sea salt (no preservatives! ), depending on the variety. The flavor is delicious, mild, and very clean! Overall, this tuna patty recipe is very forgiving. Out of bread crumbs? Use an equal amount of crushed saltine or butter crackers instead. Not a fan of Sriracha? Go ahead and skip it (although it really doesn’t add much heat). Swap the lemon and fresh parsley for lime and cilantro for a change of pace. The only ingredient I wouldn’t change is the mayo… Which is weird because the tuna patties recipe my mom made when I was growing up did not have mayonnaise in it. But after trying it a few years ago, I’ve never gone back! It adds great flavor and keeps the inside of the tuna patties tender and juicy. I like these tuna patties served over fresh greens drizzled with a simple lemon aioli. But my husband prefers to turn them into tuna burgers on a bun with guacamole — they’re super versatile like that. I love it when one recipe can please everyone… And when it’s quick and easy, too, you know you’ve got a real winner! PIN IT NOW! 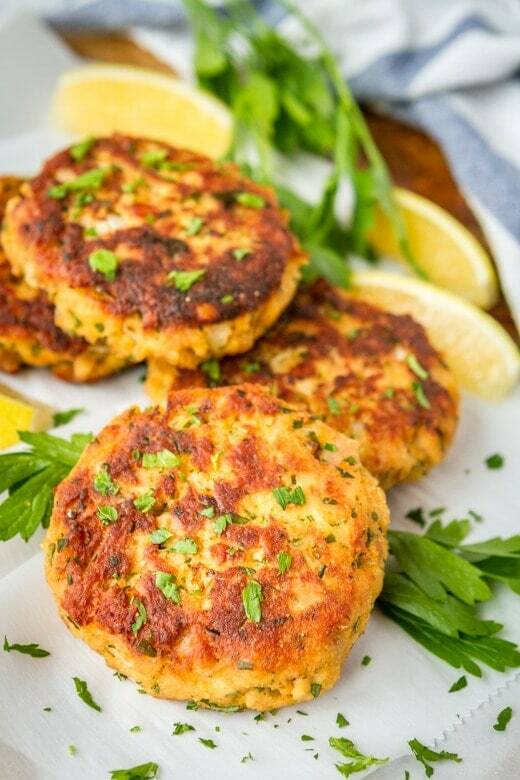 CLICK HERE TO ADD THIS CRISPY TUNA PATTIES RECIPE TO YOUR EASY RECIPES BOARD ON PINTEREST! Add the tuna to a large bowl. Stir in the onions and fresh parsley. In a smaller bowl, whisk together the egg, mayonnaise, Sriracha, lemon zest, and lemon juice. Add the liquid mixture to the tuna mixture and stir together. Add the breadcrumbs, and use your hands to combine and mix evenly. Divide the mixture into 4 equal portions, about 1/2 cup each. Shape into 4 patties, each about 1 inch thick. Heat the avocado oil (or your desired cooking oil) over medium heat. 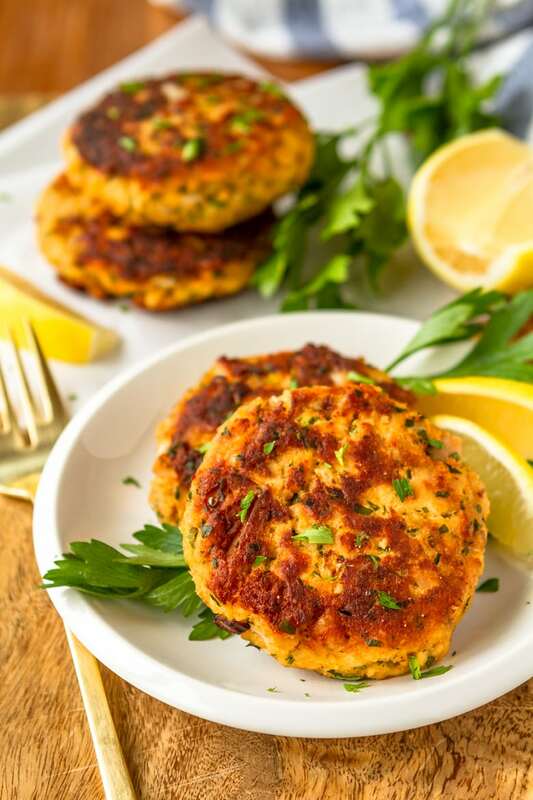 Using a fish turner, gently lay the tuna patties in the pan, and cook until browned, about 3-4 minutes on each side. Serve warm. Out of bread crumbs? Use an equal amount of crushed saltine or butter crackers instead. Not a fan of Sriracha? Go ahead and skip it (although it really doesn't add much heat). Swap the lemon and fresh parsley for lime and cilantro for a change of pace. 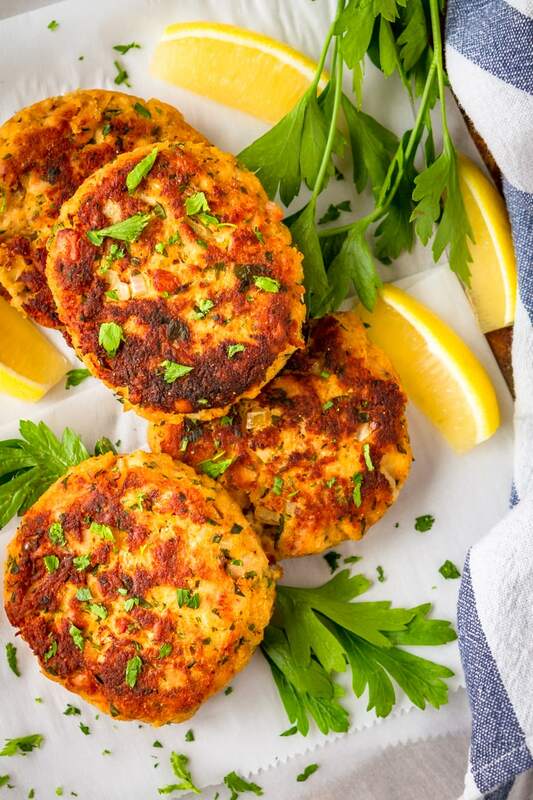 With a main dish as easy as this tuna cake recipe, you’re going to want to keep your side dishes quick and easy, as well. Here are a few of our very favorites! Instant Pot Sweet Potatoes — no more undercooked sweet potatoes, this one simple secret will produce a perfectly cooked Instant Pot sweet potato every time… Making sweet potatoes in the Instant Pot is a total game changer for meal prep or those doing a Whole30! Sautéed Green Beans with Garlic — these sautéed green beans with garlic are a simple and easy side dish… Adding a little extra raw minced garlic at the end of cooking gives them an extra unexpected punch of flavor! Loaded Guacamole Salad — dressed in a simple lime vinaigrette, this guacamole salad is a fantastic summer side dish… You’ll love the combination of creamy avocado, tangy lime, and spicy jalapeño, along with a good measure of sweet corn and black beans! 3-Ingredient Roasted Sesame Asparagus — this simple 3-ingredient roasted sesame asparagus recipe is a quick and easy weeknight side dish, yet still impressive enough to serve at a more upscale gathering! And if you’re interested in more canned tuna recipes, this classic easy tuna casserole is sure to please! Made with just 6 ingredients (all pantry staples), it’s perfect for weeknight dinners. I’d love to see how your tuna patties turn out… Tag me @Unsophisticook on Instagram or use the hashtag #Unsophisticook so I can check it out. Enjoy! I don’t usually love tuna but I would totally try these. They look delish! I’m looking at this at just the right moment! Was trying to figure out quick dinner for the family and don’t have any protein in the fridge, but I do have a few cans of tuna in the pantry. I have all of the other ingredients and everyone will love this. Thank you! I made these to put in my kids’s lunches and they loved it! Such a great recipe! These look so simple and easy to make! Delish! 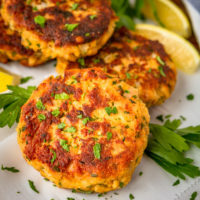 these crispy tuna patties look incredible! i cannot wait to make them! i think it will be a big hit with my kids! I think these would be perfect for a sandwich or even just a side dish or appetizer! You’re right, Keeping the mayo is a must! These are so good and my whole family loved them. This is a wonderful recipe! The tuna patties came together so quickly and easily and my family loved them! I didn’t serve tuna much until I found this recipe. Now I seem like I make these crispy tuna patties at least 3 times a month! Thanks for the delicious recipe! Hello this looks absolutely delicious but are there any gluten free substitutions for the bread crumbs? Would almond flour work? Hi Holly! I don’t have much experience with almond flour, so I’m not sure how it would hold up in this recipe. Gluten-free oats that have been given a whirl in the food processor might work. I also found some gluten-free Panko Breadcrumbs here, which should definitely work: http://iansnaturalfoods.com/products/gluten-free-original-panko-breadcrumbs/ If you try any of these, I’d love to hear your results! Hey again Holly — just wanted to share a quick update. I was flipping through my Whole30 book, and I stumbled across a salmon cakes recipe that uses almond flour. I haven’t tried it yet, but for this recipe, I think I’d start with 1/4 cup and add a little more if they seem too wet. You’re so right about the mayo. We loved these tuna patties!